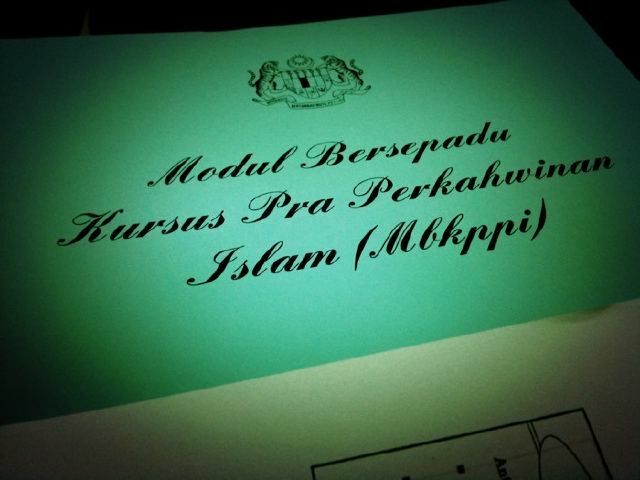 Kursus Pra Perkahwinan | Teefa Says..
Alhamdulillah Mr. Chenta and i selamat mengikuti Kursus Pra Perkahwinan yang diwajibkan untuk para pengantin kat Malaysia ni. It opened our eyes not only to marriage-related issues, it's also a reminder of how beautiful Islam is. We're human. We know these but we keep forgetting. To those who haven't attended this course, it's a one-and-a-halfday course. It covers the topics that are related to the Islamic way of living, a guide to marriage and how to live happily ever after. Ada bab Aqidah, Ibadah, Hubungan dalam Keluarga, Merancang Keluarga, stress management, Prosedur Perkahwinan, etc. It's interesting. We women would be GLAD to know that cooking, cleaning, doing the laundry are NOT our responsibility. It's theirs actually. Hehe. And the men are more than HAPPY to know that the wife wajib melayan 'kehendak' suaminya even though tengah period. It won't be easy. Give and take is the key. 1 comment on "Kursus Pra Perkahwinan"